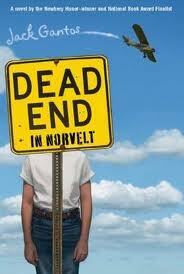 Dead End is a worthy title for this book. It deals with death on several levels, but it’s done in a comic, light-hearted way. Jack Gantos, age 12, lives in a town started for the poor by Eleanor Roosevelt during the Great Depression. It’s a socialist type of community (communist, as Jack’s dad, who desperately wants to leave, calls it) where everyone looks out for each other and trade is based on a barter system. But it’s a dying way of life and a dying town. Not only have folks started demanding cash for services, but the original residents are actually dying off. Quickly. Suspiciously. And old Miss Volker, the town’s official nurse, medical examiner, and obituary writer—and Jack’s neighbor—comes under suspicion. And as Jack has been grounded for the summer with the additional sentence of being arthritic Miss Volker’s new assistant, he’s right in on the action. I grabbed up this book eagerly when I learned it won this year’s Newbery medal, but I wasn’t crazy about it. It’s being heralded as a great “boy read.” What that actually translates to is “irreverent and a little disgusting.” For example, we get a thorough explanation of the rotten meat in the fridge, a graphic play-by-play of Miss Volker boiling the flesh off her arms (she’s actually treating her arthritis with hot paraffin), and some descriptive visits to the embalming room at the local funeral parlor run by Jack’s friend’s father. Mr. Gantos (the author, not the character) also has a good deal of fun with Jack’s nose bleed problem, which is constantly saturating the landscape in scarlet. It doesn’t contain anything to be alarmed over; I simply wasn’t taken with Mr. Gantos’s style. On the bright side, the book does contain a fair bit of humor that even I chuckled at. I also enjoyed the history lessons that are woven throughout. And the story actually has a good deal of depth to it. The characters are endlessly original and quirky as well. The content, aside from being blunt and a little gross at times, is fairly clean. I don’t recall any swearing. If so, it was infrequent and mild. Jack does, however, make up his own brand of profanity, “Cheese-us crust,” which I, like Jack’s mother, still found offensive. A few broad social statements are made through the viewpoint of Miss Volker, like war can only be won by the most brutal, and all religions are essentially the same. But the primary message is that history, if it is not learned, is bound to repeat itself. I have heard of this book, but never really wanted to read it. I read that a lot of people really liked it but I think it sounds kind of gross. It wasn’t terrible, and it did have some really funny parts, but it just wasn’t my style. wow – i’d never guess that was what the story is about from the cover! thanks for sharing, and happy (late) mmgm! Thanks for stopping by, Gina. Yeah, it kind of threw me, too. You beat me! Oh, how I’ve wanted to review Jack Gantos new book. He is a very favorite author of mine. Nice review. Much of his writing is drawn from his childhood. My favorite series by far, is “Joey Pigza Swallowed the Key,” (ADHD) followed by three other books. He writes so well, but he had some good teachers. Loved the review. Thanks Michelle. He is very talented; the writing is super, just not my style. I assumed by the character having his name that he might be drawing from childhood. I’ll have to try another one of his books. “Human cadaver fluids” Oh dear. That is not a good endorsement. Sounds kind of fun if you are REALLY into gross. Me, not so much either. It probably does appeal to some boys (and girls). Good review.